Most of us know what spectacles are. From reading, stitching, crafting to watching TV, we use our spectacles on a daily basis. Did you know that there are many more types of smart glasses than just the usual reading glasses? Here are 6 smart reading glasses you didn't know existed. Want to watch TV or read a book but too lazy to bend your neck? This pair of lazy reader glasses is the solution! Use these lazy glasses to read or watch TV while lying down without having to tilt your head. The specially mirrored lenses project the text from the book or image from TV to your line of vision even though you're facing the ceiling. Avoid using these glasses for a longer period of time. Feel like a spy as you wear these cool eyeglasses with a hidden camera. If you notice someth‌ing fishy or unethical act in front of you, simply record the act discreetly. No one would even come to know that your eyewear has a hidden camera and recorder. You can record both photos and videos without anyone realizing it. No matter what you do, see everything large and clear with this pair of magnifying eyewear. Usually, we use a magnifying glass to see things big. But, these magnifying eyeglasses make everyday tasks easy. 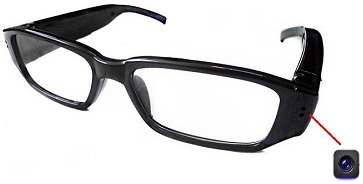 These eyeglasses are ideal for people who indulge in reading, craft etc. The best part about these glasses is that it fit over your regular prescription glasses. These clip on sunglasses come with a polarized lens which reduces glare and reflection. It is ideal for driving, riding or any other outdoor activity. These clip on sunglasses offer maximum protection from UV rays. This scratch proof frame fits on both your metal and plastic frames. Put on the yellow lens improves your vision at night. Be it night or day, get clear and glare proof vision with clip on sunglasses. 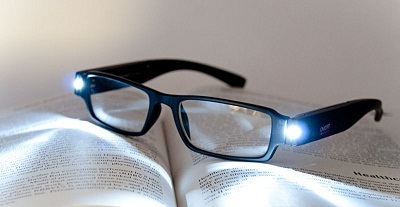 These eyeglasses with LED light provide light to whatever you are viewing. Whether you want to view an object in darkness or read in the night, these eyeglasses are your best bet.